Raw Milk. What's In It? Just what is in raw milk? Think of it is as an oil/water emulsion. It's also known in some circles as a colloidal suspension. To make every gallon of milk, a cow must pump from 600-800 gallons of blood through her udder. Think of that next time you pour yourself a glass. That cow poured her heart into it! Whole raw milk's composition varies slightly among cow species, type of food and other conditions, so the figures below (and, at right, from a commercial raw milk dairy) are only approximations. Few words are as highly charged in the food world as "fat." Perhaps "lipid" would be a better word. Please see my Fat Primer for images and more information on this wonderful, energy-laden food group. Milk also contains cholesterol, another controversial and dreaded word. 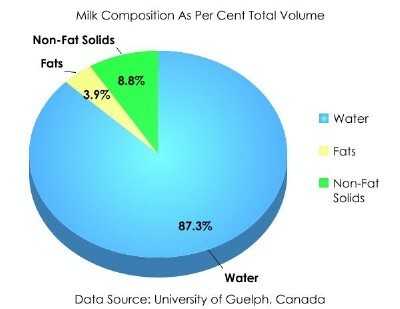 For the most part, it's located in the cores of fat globules, and amounts to roughly 0.3% of all milk lipids. The less we get in our diets, the more our bodies make on their own. Check out my Cholesterol Primer to get the straight scoop on why this much-maligned substance is essential to our health. Proteins are complex molecules comprised of long chains of amino acids. Depending on interactions between some of the amino acids, the molecules can twist into helical formations or pleated sheets (secondary structure). Tertiary proteins undergo further coiling and folding. When clustered together somewhat spherically, they are known as globular proteins. Fibrous tertiary proteins are formed when two or more long strands of amino acids form links along their length. The caseins, normally highly digestible in the intestinal tract, are relatively heat stable. Being secondary in structure, and so without much complex structure to unravel, they survive the heat of pasteurization (145-160 deg. F.) fairly well. After ultra-high temperature (UHT) pasteurization (280-305°F./138-152°C.) their fate is uncertain. The whey proteins,including the immunoglobulins, are very sensitive to heat (heat labile) and denature well below the heat of normal pasteurization. Incidentally, the denaturation of whey protein affects the whiteness of milk. Milk gets whiter after it's processed. By the way, did I mention that not all raw milk is the same? It's not. Check my About Raw Milk page to find out why. Lactose, the first carbohydrate most baby mammals ever taste, is actually made up of two simple sugars, glucose and galactose, making it a disaccharide. Cow's milk hovers at around 5% lactose (human milk averages a bit higher at just over 7% by comparison). 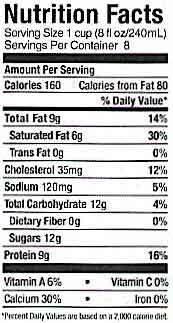 It's got a fairly low glycemic index (doesn't boost insulin levels very quickly) and so is better tolerated by diabetics. As some people age, their levels of lactase, the enzyme needed to digest lactose, drop significantly. When they consume heat treated dairy products with no remaining food enzyme activity, they lack sufficient lactase to break the milk sugar down, and suffer numerous unpleasant symptoms, notably gas and bloating. Not fun. But raw milk, with live, friendly lactobacilli, has its bacterially-produced lactase intact, so chances are good these folks may be able to tolerate it. Another way to enjoy the benefits of dairy with almost none of the lactose, is to eat fermented products such as yogurt and kefir. The friendly microbes, during the fermentation process, have consumed pretty much all the lactose, turning it into the sour tasting lactic acid that's such a powerful antimicrobial agent. Raw milk cheeses are another tasty way to enjoy dairy without the lactose. Again, most of the lactose is consumed in the fermentation process. 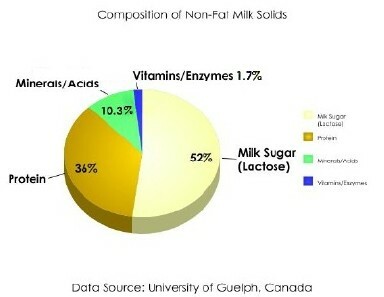 The mineral content of milk varies with a host of conditions as well. Soil quality, geographical location, species of cow, health of the animal- all these factors and more come into play. Raw milk contains every known fat and water soluble vitamin. To get them all, make sure you drink whole raw milk or you'll miss those lost in the skimming process. Yet another controversial topic, and important enough to deserve a website all its own, the enzymes in raw milk are crucial in making it the valuable healing food it is. The arguments range from their having no digestive benefit because they can't withstand the acid environment of the stomach, to outright denial of their existence. No one can truthfully or knowingly deny that these powerful but fragile protein-based substances are in milk for a purpose. Getting people to agree on that purpose is another matter entirely! To understand their importance, it's helpful to know what enzymes are, and what they do in foods and in our bodies. Basically, enzymes are complex forms of protein (made out of amino acids) that can change (catalyze) other substances without taking part in the reaction themselves. In digestion, for instance, they help break down starches, fats and proteins into chunks the body can use.